v2.5 is finally getting finished, almost a year after v2.4. The delay is mostly because I had two quite long breaks from development this year. One during summer and one during winter, with focused development periods in the spring and fall. In this post I will summerize some of the changes that I haven’t got around to blog about. I will shortly put up a development version on the web page which you can download, try, and give me feedback on. I’d be very thankful for that and will give you credits in the changelog. Two new item categories now needs to be identified before they can be used. The first one is the new Meditations that I wrote about earlier. Btw, meditations are found as censers (thank you HedoNNN for the suggestion). Censers, like wands, cost 5 Ep to identify. Moreover, rods now also require identification before use. This is slightly balanced by the simplification in Ep-regeneration and a buff to most damage rods (2-3 elemental damage felt a bit underwhelming even if it affected a group). They cost 5 Ep to identify. This means that the difference between a rod and wand is getting smaller, and it is possible that the distinction goes away in the future (after v2.5); a rod could be seen as a once-per-day spell with 0 Mp cost. Flavours tend to confuse players new to the genre. “is a blue potion always the same?” is a question that I’ve got more than once. I also didn’t like how “icy potion” was a flavour while “freeze potion” was a concrete potion. As the number of items and item categories in TGGW steadily increases, so does the number of flavours and flavour categories. I don’t feel it is worth to keep up the work in inventing flavours (or writing flavour generators) for a feature that doesn’t add much to the game. The game has evolved a lot since release #1, and flavours were there from the start mostly by tradition of what other roguelikes used to do. 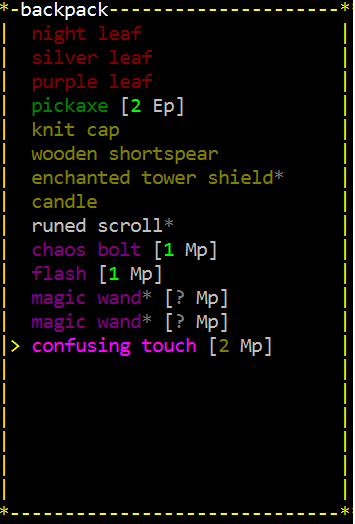 Instead of flavours, unidenfied items will have a generic name: potion, runed scroll, magic wand, magic rod or censer. In addition an asterisk (*) is added to the inventory to clearly mark it as unidentified. In this way you can, at a glance, see which items still needs to be identified. I’ve also added a rest warning that tells you if you still have Ep to identify an unidentifed object in your inventory. The thievery attribute (former “steal/disarm”, former former “avoid traps”) is now displayed in the main attribute window because it is more important since the introduction of thief weapons. It still works just like before but have now a dual representation for clarity. The actual attribute is now 5+vision-noise, it also have a percentage representation, which most often is simply thievery*10, except when theivery is negative or above 10. In addition, the thievery attribute is now shown in the equipment comparison window, so you can see how equipping something affect your thievery. Finally, the thievery attribute deriving formula is displayed in the z-menu, so you can see how it is computed. Thievery is presented both as a number and as a percentage. As you can see, the thievery attribute occupies the space previously taken by rElec and rAcid. However, those resists are being so rare so they are now instead shown in the status panel when available. Traps now have an additional use: you can disassemble them to obtain the parts that they are made of. You can press ‘x’ to disassemble a trap for 3 Ep. Not all traps can be disassembled in this way, but a majority of them can. This idea came from savagehill. But can’t see download links, am I right or am I right? was afraid someone might react to that, which is why I tried to explain my reasons clearly. This is not a movement in favour of mechanics over flavour, it is just that I think item flavours does a bad job at describing items in an interesting way. There are other things that make the game more immersive though: the new immersion mode, a new category of (useless) items that are for pure flavour and suspense, and the dungeon (in particular underground) is also more varied now. yes i definitely respect your reasoning despite my disagreement. 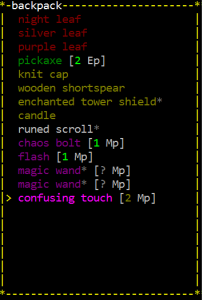 I just have a very foul taste in my mouth from DCSS and their bizarre obsession with removal of anything remotely fun and flavorful. In my mind though… it might get annoying seeing multiple “unidentified X” because sometimes (even though it obviously means nothing) i choose the most interesting flavor text to identify first… i dunno…. its hard to explain but it will definitely be missed for me. I can absolutely understand this, and I understand that you will miss it. Most changes I do is with mixed feelings even for me.